Cornwall has had something of a mixed week. On the plus side, there was the government’s decision to grant it national minority status. Now, whatever the legalistic merits or demerits of such status, there’s no doubt that Cornwall is, and always has been, a very different place. That was immediately apparent to me after I moved down there in 1979 to begin my first teaching job, at a school in Newquay. (We had a high truancy rate during the summer, but at least we know where everyone was: they’d be surfing on Fistral Beach. And that was just the senior management team.) As I wrote in a previous post, if my three years there taught me anything (apart from the fact that a pint of Guinness and Lucozade is a viable drink), it’s just how ferociously independent the Cornish are; a Cornwall vs Gloucestershire rugby match at, say, Camborne’s tightly packed old ground, is treated essentially as an international, with black and white St Piran’s flags waving everywhere and the strains of the ‘national anthem’, Trelawny, echoing from the terraces. There was the language, too, still all pervasive in place names and surnames (as my first class registers quickly demonstrated). Much of the language was actually quite familiar, as Cornish is very similar to Welsh, and I swiftly learned the single most important Cornish phrase of all – ‘non emmett’, literally ‘not an ant’, intended as ‘I’m not a tourist’ or, more pointedly, ‘Not English’. As readers of the Quinton Journals will probably know, I provided Matthew Quinton with a somewhat obstreporous Cornish crew in part as a tribute to the time I spent living west of the Tamar, and the names of several of them were drawn from former students, colleagues or acquaintances. 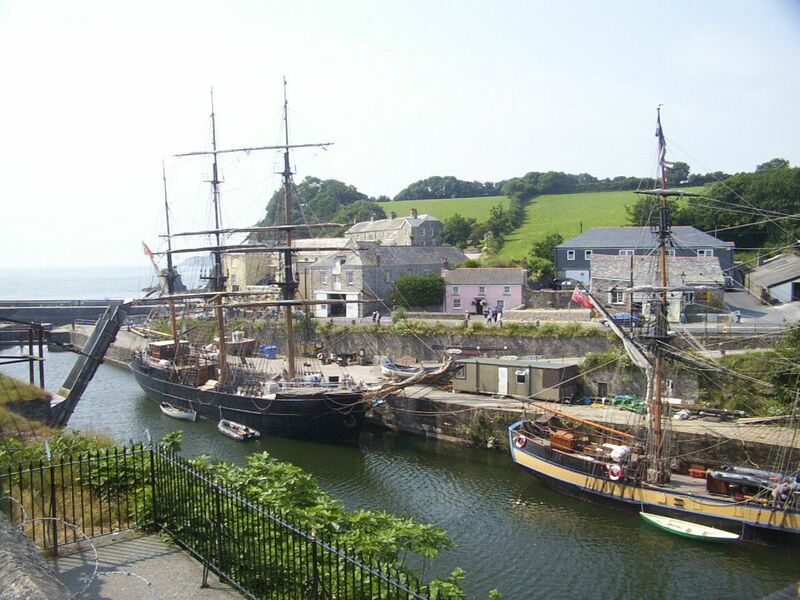 I’ve also tried to work in snippets of the Cornish language from time to time – the latest book, The Battle of All The Ages, includes the first lines of the Lord’s Prayer in Cornish – while Gentleman Captain has a poignant funeral scene which culminates in the singing of the lovely old Cornish song, The White Rose. But then, on the minus side, there was the BBC’s adaptation of Jamaica Inn. Auntie must have thought that this would tick all the boxes for prime time Easter viewing. Excellent cast acting their socks off? Check. Former Downton Abbey star? Check. Glorious scenery on Bodmin Moor? Check. Strong story by a bankable name, i.e. Daphne du Maurier? Check. And then it all went terribly wrong, with a torrent of complaints from viewers who simply couldn’t understand what the cast were saying. The Beeb grovelled, assuring the world that it was a problem with sound levels and not that the actors were mumbling. So the ‘sound levels’ were adjusted…and the complaints continued. But let’s be honest, shall we, all you Disgusteds of Tunbridge Wells who complained to the BBC about the ‘sound levels’ on Jamaica Inn? Yes, some of the cast were mumbling, and no doubt the Beeb finds it easier to blame anonymous backroom techies than highly paid, precious luvvies delivering ‘naturalistic’ (aka unintelligible) performances. But on the whole, it seemed to me that there was nothing seriously wrong with the sound levels, or even with much of the delivery. Isn’t it more likely that many of you simply couldn’t understand the ‘Cornish’ / generic Mummerzetshire accents that the cast had adopted, but were too polite or nervous to say so? After all, these days complaining about ‘unintelligible’ accents is akin to being labelled a racist: and as a Welshman who still has to smile tolerantly at people’s ‘witty’ stabs at cod Welsh accents, which invariably come out as more akin to Bangalore than Bangor, I’d respectfully contend that I know what I’m talking about. Before one could eat a pasty or a cream tea, the critics of mumbling had been joined by the historical accuracy brigade. Aargh, it’s the wrong type of plough / coach / hymn! They’re not reloading their pistols before firing them again!! It was interesting that these criticisms focused overwhelmingly on the terrestrial aspects: perhaps it’s a sign of Britain’s apparent ‘sea-blindness’ these days that few people seem to have picked up on the rather more fundamental plot holes in the maritime aspects of the story, e.g. how a crewman of a sailing ship in 1821 could guarantee that his vessel would depart exactly at a given time on a given day, or why wreckers would choose to operate in broad daylight, for goodness sake. Those who actually know the geography of Cornwall might also have boggled at some of the journey times implicit in the story: Jamaica Inn to the coast = short stroll over adjacent hill, rather than the actual distance, namely six or seven miles; getting from Launceston Gaol to Roughtor = quarter of an hour, tops (good luck with that one in a Formula One car, let alone on horseback). Of course, the BBC will respond by pleading dramatic licence, and I’ve used enough of that myself to sympathise, but there’s a very fine line between dramatic licence and laughably implausible, which itself is merely a fine line away from just plain wrong. But all of this is really a very long-winded preamble to a plug for my appearance at the Penzance Literary Festival in July – to be precise, at 11.00 on Friday 18 July. I’m talking on Cornwall in naval history and naval fiction, so will be touching on the stories of the likes of Sir Richard Grenville and the Pellew brothers, as well as fictitious characters like Alexander Kent’s Bolitho and, yes, Matthew Quinton’s Cornish crew. It should be great fun, and if any of you are going to be in the area and fancy coming along, it would be terrific to meet you. While I’m down there, I’ll also look forward to a rare chance to revisit some of my old stomping grounds – maybe even ordering a pint of Guinness and Lucozade in the Jamaica Inn itself, and acknowledging receipt of same with a cheery ‘Proper job, me ‘ansum!’.